One of the most enjoyable things about blogging F1 is the community of like-minded enthusiasts that builds up around the blogs. I have blogged in other areas for many years and know that this is especially so when it comes to F1. Competition for traffic might be the norm between other bloggers but F1 bloggers support and encourage each other without exception. An excellent instance of this co-operation and goodwill is demonstrated on Ollie White's blog, BlogF1, this week. Ollie is one of the most respected bloggers of F1 but never allows that to go to his head; in an article entitled BlogF1 Welcomes The Red Bullog To The F1 Blogosphere, he takes the time to enthuse over a newcomer to the blogosphere, The Red Bullog. That shows the excellent spirit of F1 blogging at its best and it gives me a warm and cuddly feeling to be a part of such a community. We care, too, when another blogger hits problems and are always prepared to help. Duncan Stephen, of Vee8, has been pondering lately on how to balance the increasing demands on his time and energy; he has asked for suggestions in his article The future direction of vee8 and the response shows just how well-regarded he is by the F1 blog-reading community. It is clear that everyone wants Duncan to keep blogging, even if it has to be at a reduced rate. In the F1 blogosphere, there is one blog that stands head and shoulders above the rest, however, and that is Keith Collantine's F1 Fanatic. Keith's prodigious and up-to-date output, his sensible and balanced articles, and the civilized conduct in his Comments system have made his blog the one everyone visits daily. F1 Fanatic is truly the F1 blog that sets the standard. So the temporary closure of the blog while Keith searches for a more reliable web host has left us all desperate for his return. It is now three days since the disappearance of the site and I am suffering the withdrawal symptoms that must be common to all who follow F1 on the net. It has become so bad that I have even been induced to look at Twitter (something I have never visited before - the name puts me right off) in my desperation for news on the move to a new server. I am sure that I speak for all in begging, from the depths of my F1 Fanatic deprivation, for the return of Keith to the F1 scene. Hurry back, Keith - we cannot do without you! 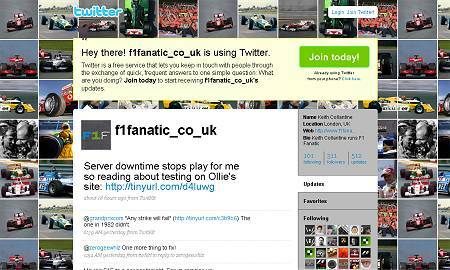 Oh — what a relief to find out that I´m not the only one F1fafanatic addict in the web. I think we all are, Becken! Aw thanks guys you're too kind! Merely the truth, Keith. And looking forward to the return of the site! That screenshot has reminded I actually have two Twitter accounts. Yep, F1 fanatical and proud! I think we've both said in the past, Clive, that it is the community that makes F1 blogging so much more enjoyable. I don't know of another niche that has such a strong bond between all its members (bloggers and commenters). To be honest, Ollie, I don't really see the point of Twitter - although it has been a much-needed source of updates during Keith's absence. I joined Facebook ages ago at the insistence of an acquaintance and I don't get that either. Maybe it's just one of those things that takes me a while to get my old head around. Excellent post Clive, which pretty much sums up the decent community spirit that seems to be thriving in the the F1 blogosphere! I have to admit that reading Ollie's post about my blog really did put a smile on my face when I read it. Getting a blog up-and-running is a bit of an struggle. Wondering if people actually bother reading it, if it's worth the hassle etc etc. I was almost on the verge of calling it a day, but reading Ollie's kind words put the wind back in my sail! i'm glad i'm not the only one to "not get" facebook. to be honest, it's just dead annoying at times, though i've been tempted to log in today to see if keith posted anything there. one thing i have to say about the f1 bloggers that you don't always see on other "fan" blog sites-none of you are slaves to your own cleverness. every post is balanced, thought provoking and yes, clever but never in the condescending way that plagues the blogosphere. and the humour is actually humour at no one else's expense....well, okay, max and bernie deserve everything they get, but even there i've never heard any of you actually descend into snark. and you all have alot of respect for each other. that makes you all very valuable resources. Always good to promote a new blog that shows promise, Dank - and yours is proving excellent. I am particularly impressed at the quality of your articles and the frequency of posting. Keep that up and the readers will come! Totally off topic but I know Clive is a big fan of Mario Theissen and the good doctor came up with the best riposte ever to Max so I am sure I will be forgiven for deviating from the topic. "It is good that Max is learning about the engineering sides of the car," said Mario Theissen, "I think with a little further understanding he may soon know as much as Flavio Briatore." For a comment as good as that one, Steven, anything is forgiven! That is absolutely classic - and Dr Theissen goes up even further in my estimation! Will do, George. Hopefully, I have the right address for you - it comes from an email correspondence between us when you were just starting out with F1 blogging. Unfortunately, I do not have access to email addresses on Comments (must speak to Mad about that...). I was wondering where Keith had got to, thought he didn't like us anymore ! Although the absence of F1Fanatic did mean I got a lot of other things done this weekend ;) so it wasn't all bad. And thus far, I have resisted the many calls to Facebook. I just CBF with it. Facebook doesn't work on my computer, so it's unlikely I'll be joining in that particular social network any time soon. That said, I am on the Ning and Club Force networks, so I can hardly say the social networking bug hasn't bit me. I thought this was a social network? Hah! Good point, Lonny. Perhaps my point is really that I just don't have enough time in the day to build networks in other applications.